Money does not come from the state! Actually, no one believes that statement. But they should. That is because America, like every other country in the world, has a pure paper money system, in which new money is created out of thin air. Andreas Marquart and Philipp Bagus show you how money arises and why our current money is bad money. You will learn how important good money is for an economy and what influence bad money has on everyone in society. What role does the state, government, and politics play in redistribution in favor of the super-rich? Why is a naive faith in the state anything other than a good strategy for the future for each individual citizen? Anyone who has never really trusted politicians - even if it started out as only a gut feeling - will find confirmation in this book that this gut feeling was right all along. An easy to understand introduction to the question of why money is responsible for so many problems in our society. "A great introduction to Austrian Economics that shows how fiat money is the root of most evil — including income inequality, the the rise of the welfare-regulatory state, and even the decline in morality. This book should be read by all seeking the truth about the cause of, and cures for, our slide into political authoritarianism and economic collapse." 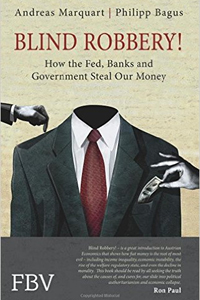 "Andreas Marquart and Philipp Bagus have written an absorbing, compelling, and logically unassailable defense of sound money against the inflationary government alternative. The knowledge in this beautiful book is unknown to virtually everyone, and almost no one learns about it in school. But our Prosperity depends on it. It's your responsibility to read it, master the message it contains, and place it in the hands of as many of your friends as you can."